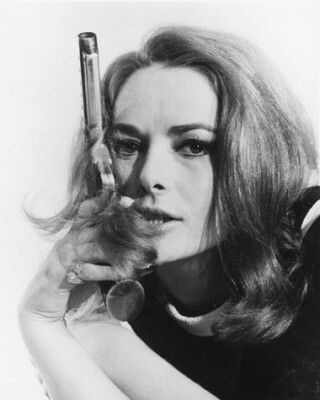 The JBIFC is very sad to report that the German actress and Bond woman Karin Dor has passed away, aged 79. She died in Munich on Monday 6th November, 2017. Dor was, of course, the main femme fatale in Sean Connery’s fifth 007 movie You Only Live Twice (1967), in which she played the key role of SPECTRE agent no. 11, Helga Brandt, doubling up as Mr. Osato’s personal secretary. Brandt first met Bond during his undercover visit to Osato Chemicals, a scene that led to some light-hearted flirtatious dialogue (“Mr. Osato believes in a healthy chest”), which both Connery and Dor played brilliantly. After she failed to kill Bond, later in the movie Brandt famously met a gruesome end at the hands of SPECTRE boss Ernst Stavro Blofeld, when she was pitched into his pool of lethal piranha fish, a scene that nearly fell foul of the censors. Karin Dor won the role of Brandt after she did a screen-test playing the interrogation scene on the Ning-Po, with Terence Longdon standing in for Connery. She is said to have impressed the EON producers and director Lewis Gilbert. During filming of her scenes in the movie, Dor said she really enjoyed the role, ‘as the bad girls in the Bond films are usually the most interesting’. After You Only Live Twice, Karin Dor went on to star in Topaz (1969), directed by Alfred Hitchcock, and also took parts in numerous German-language TV productions. She also enjoyed receiving fan mail from Bond fans around the world.